Free Printable February 2018 Blank Calendar. 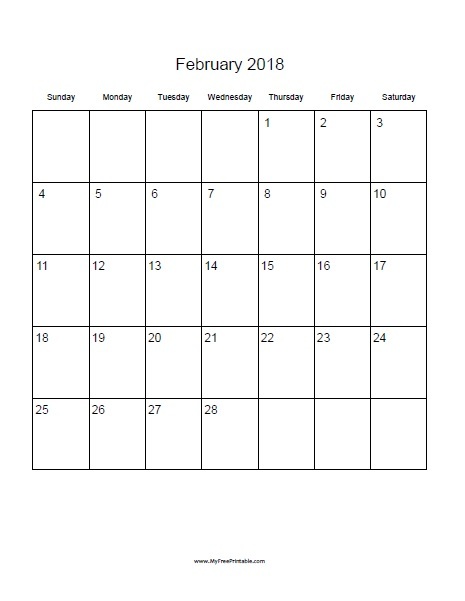 If you need a February 2018 blank Calendar for planning and organizing, this is the one. Simple and easy-to-print in Adobe PDF format can be printed with your home or work printer in any 8 ½ x 11 inch sheet of paper for personal use. Write all you need to remember this month like Valentine’s Day, so you don’t forget to buy the flowers for your loved one. The calendar is available in vertical and horizontal orientation with the week starting on Monday or Sunday. The horizontal version of the February 2018 calendar includes the previous and next month. Use the link of your choice to download or print now.